Recently, p2p lending service Isepankur opened to international lenders. Residents from any European Union country and Switzerland can now sign up and start investing. There are no fees for lenders. I wanted to gain first hand experience as soon as possible so I signed up immediately and now share the process. Registration takes place completely online. First click on ‘Join for free’ and choose a username and a password. Isepankur now sends an verification email. After confirming that, there is a form where the personal details are entered. Also choose between confirming bids via password or mobile ID. Depositing funds is done via SEPA bank transfer. For transfers done in Euro this does cost the same bank fee as a domestic bank transfer – in my case it was free. I transferred 1,000 Euro in and the amount was credited to my account the next day. Before investing is possible, Isepankur needs to confirm the identity of the lender. 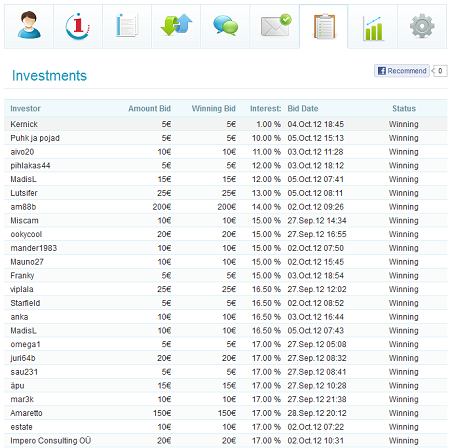 That was completed the same day the money arrived, and I was ready to start investing. 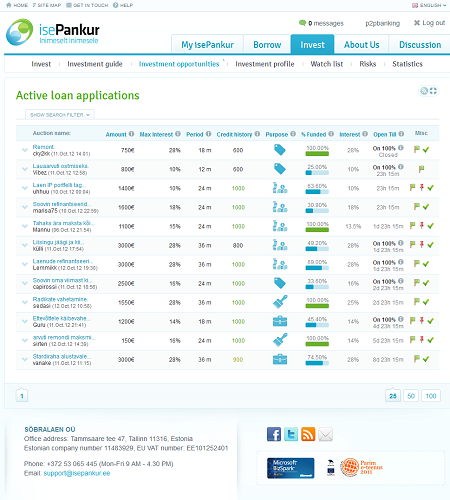 Isepankur uses an auction model, where individual p2p loan applications are listed. Lenders can either manually bid or use investment profiles for automatic bidding. Under ‘Invest’, ‘Investment Opportunities’ is the list of open loan auction. There are two different types: those that close immediately once 100% funded and those that continue to run until the auction time ends with investors underbidding each other’s interest rates once 100% funding is reached. By clicking on a loan listing, the detail information can be reviewed. Isepankur only allows fully employed borrowers on the marketplace and checks their income and credit history. 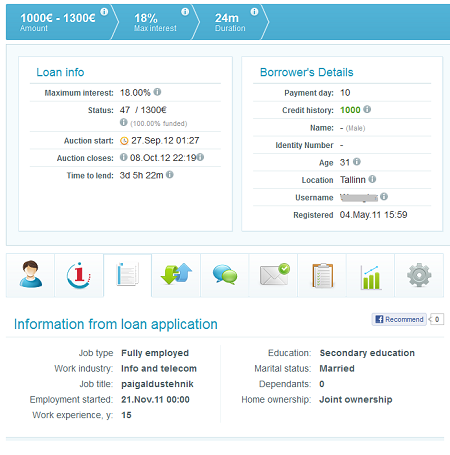 Sample of the detail information on the loan application. Lists age, type of employment, length of employment, education level and home ownership. Sample of the detail information on the loan application. The borrower has an income of 775 Euro and existing liabilities of 165 Euro per month. I decided I wanted to invest into this loan and made my first bid. My strategy is to concentrate to loans with good credit grades and achieve a high diversification making bids in the range of 20 to 30 Euro. Looking at the list of bids (see below) I decided to bid 30 Euro at 10% interest. To make the bid you electronically sign the loan agreement (PDF) via your password or your mobile ID. Excerpt of list of bids on this loan. When the auction closed, the highest winning bid was 12%, meaning all winning bidders – including me – receive 12% interest on this loan. I was informed via email that my investment was issued. I read in the FAQ that the borrower receives the funds within 2 hours of the auction closing. My intention is to get a modest exposure to higher risk loans with fair credit rating while putting the bigger amounts in loans with very good credit grades. The minimum balances set are selected to always reserve at least 60 Euro cash for bidding for any listed new top rated loans. 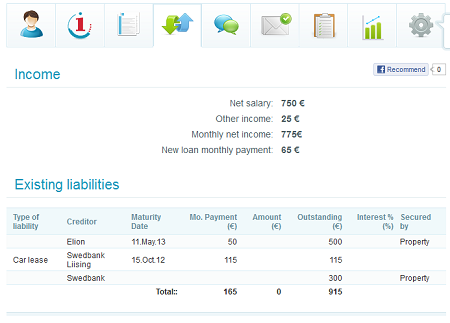 After two weeks I now have invested 975 Euro in 37 loans. Most of it through the automatic bidding. I already transferred another 500 Euro into my account. One learning is that the interest rates I set in the investment profiles are practically minimums as most of the loans the investment profiles did bid on actually closed on higher interest rates. Since all winning bidders get the same interest rate than the highest winning bid, that means a bid at 14.5% can end up in an investment at 20%. Some of the loans never make to manual bidding, as they are 100% funded instantly my automatic bids the minute they passed the background checks and the bidding starts. I only can see them, because one of my investment profiles bid on them and I got notified and they are in the list of my investment. A lender with a manual bidding only strategy will not be aware of the existence of these loans. Next month the first repayments are due. I will sporadically write an update of how my portfolio is doing. I am also currently using this service. In my opinion, the implementation of the investment profile is a bit risky because the credit score is only based on past or current payment defaults. Hope you post regular updates on how your strategy goes !